Today we have added a new feature to Blender’s Collada Module, that is a very limited support for bind poses. This feature has been added to support foreign developer kits which have been created using poses different from the SL T Pose. This feature is fully supported by Avastar. But we have improved Blender also for all users who do not use Avastar for whichever reason (see below). When you work with developer kits which have not been created with Blender, and which are distributed by using Collada files (.dae) then the Blender Importer replaces the imported Restpose by the imported Bindpose and makes that its new Restpose. This is no issue when the used Bindpose is a T Pose compatible to SL. But when you import a Rig that was made for A Pose (some popular developer kits use that) then up till today Blender standalone was not able to handle this in a convenient way. So users where left with trying to somehow convert the A posed rigs to a T Pose. And when fitted Mesh comes into play the problems only get worse. 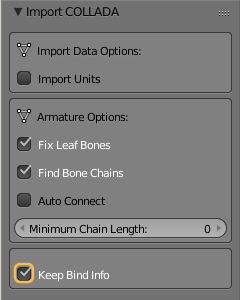 Basically the Blender Importer now stores the original Rig Information (Restpose and Bindpose information) into bone properties namely: rest_mat and bind_mat. Later the Blender exporter can use those matrix information when it exports a rig as Collada files. This ensures that the Rig data exported from Blender is fully compatible to the Rig data that was previously imported from the devkit collada file. The change in Blender should become available within the next 24 hours (around 24-march-2017) in the daily blender build The change will be part of Blender 2.79. We also have updated the reference documentation. When to not use it? The bind pose support can be used in theory for any rig (human or not human). But for now we recommend to use this option only when you are working with human rigs with bind poses which have been created only by using bone rotations (Belleza is a popular example for this). This is the most simple case which creates the most reliable results. Bind pose support works as well but you also have to provide a restpose animation to get the bones into place. We will document that soon on the Avastar.online website. Remind: This is only of importance when you have to work with a developer kit that comes in form of an SL compatible Collada file (Belleza, TMP, …). How do i import this to Second Life? Import as usual, but ensure that the option with joint positions is disabled!